If you're planning to get a tattoo, you've probably thought very carefully about where you want to get it. For most people this decision is all about aesthetic, but it's also worth considering how painful it's likely to be—especially if you're a bit of a wimp when it comes to how much agony you can handle. There's a real difference in how painful a tattoo is likely to be depending on where on the body you get it, so we decided to ask Fredrik Glimskär, founder and CEO of online tattoo marketplace Inkbay, to highlight some of the places it's likely to be most painful. "Tattoos are great, but I’d be lying if I said they were completely pain-free," he says. "There's no place on your body where you won’t feel the scratch of the needle to some extent, but there are certain places that hurt more than others," Fredrik adds. The ribcage is a particularly painful place to get a tattoo, explains Fredrik, because "you don’t have as much fat, muscle, or skin on your ribs, meaning you will feel the scratching of the needle a lot more." He also suggests the heightened pain "could be down to the central nervous system, as the nerves surrounding the ribs are supposedly really close to the surface of the skin." And one other reason a tattoo on your ribcage will hurt is that "the ribs move every time you breathe, which makes the tattooing process more painful." According to Fredrik, "the worst thing about getting a tattoo on the ribcage is that the pain doesn’t let up. I’ve had tattoos all over my body and usually after about 1-2 hours, once the body is used to it and stops reacting, the initial pain signals subside a little. This isn't the case with the ribs, the level of pain is consistent throughout–for six hours in my case!" Although Fredrik has never had a tattoo on his head personally, he's heard from those who have that it's renowned for being really sore. "Not only is it painful because of the lack of fat and abundance of nerves here, but apparently the noise and vibration is a little scary—it can feel like they are drilling your skull!" Delightful. "There is definitely a psychological as well as physical pain barrier to get over when it comes to getting a tattoo," he points out. "In theory," says Fredrik, the inside of the thigh "should be one of the less painful places to tattoo because it isn’t close to the bone, and there is a lot of flesh and muscle." But in reality, it can be one of the most painful locations on the body to get a tattoo done because "it's an area that isn’t as exposed and is therefore more sensitive. It may also be more painful than other areas as it heals, purely because it will likely rub against your other leg quite frequently," he adds. Not to freak anyone out, but from Fredrik's own experience, a tattoo here "hurts like hell." Why? "Two out of the three main nerves in the arm run right under the inner elbow, making it highly sensitive," the Inkbay founder explains. "Whenever the nerves are pinched, it can cause pain to run right through the arm, not just the area where the needle is," he says. A tattoo around your feet and ankles can cause so much pain and discomfort because "the skin is so so close to the bone, with very little fat to pad or cushion the needle strokes." Ouch. Same goes here. "Like the feet and ankles, there is little fat there," explains Fredrik. And as well as that, "there are a surprising amount of nerve endings on the inside of the wrist," which can only add to the pain. "Having a tattoo on your hands and fingers is painful for a number reasons; the skin is thin and therefore sensitive, they are bony and filled with ligaments, and, as the ink doesn’t stick to this area of skin very well, the tattoo artist may need to go over the design a few times," says Fredrik. Granted, an armpit tattoo might sounds like an odd one, but people do get them done. And it can be particularly sore, the tattoo marketplace founder explains, "because the axillary nerve is located here as well as the glands, and the skin around the armpit is extremely sensitive." A tattoo on the outside of your arm tends to be far less painful than one on the inside of the arm, Fredrik explains, "because the skin on the outside of the arm isn’t as close to the main nerves running through the arm. For example, while the inside of the elbow is notoriously painful, when I had the outside of my elbow tattooed I could barely feel it," he recalled. 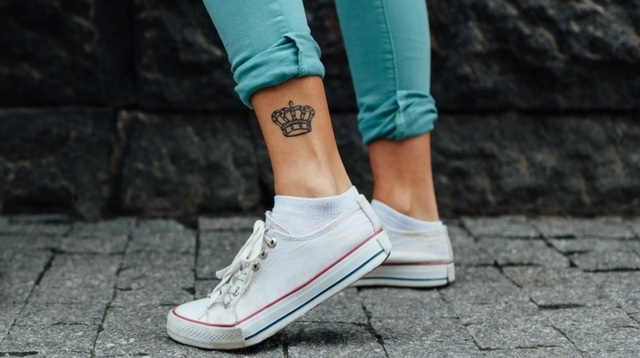 "Anywhere in the area above the ankle and below the knee is a good place to get a tattoo, especially if you opt for the side of your calf muscle, away from the shin bone," says Fredrik. This, he explains, is because "there aren’t as many nerve endings in this area. As you get to the back of the calf, near the back of the knee, it will become considerably more painful." "The outer shoulder is a common place for people to get their first tattoo as it is considered one of the less painful areas—again, this is because there are few nerve endings in this particular area, and there is enough flesh to provide cushioning against the needles," the Inkbay founder says. Find out more about Inkbay here.